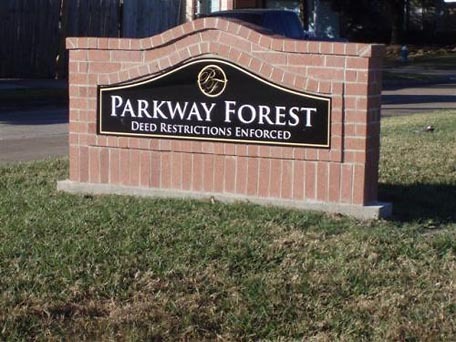 The Parkway Forest Property Owners Association was incorporated in July 1977 and consists of 870 properties. The community is located off Beltway 8 and Tidwell. The business of the community is handled by a seven (7) member Board of Directors that volunteer their time daily to maintain the integrity of the Association. Each decision made by the Board is carefully thought out, studied, and agreed on only if it is for the betterment of the community as a whole. Parkway Forest is also very fortunate to have the Spirit of Pride committee volunteers who assist the Board and plan wonderful events for the community to enjoy. The committee alone with the Board coordinates and hosts a Spring Fling, Fall Festival and Community Garage Sale. The events are designed to promote, enhance and strengthen community socialization. The community prides itself on their most recent improvements. A new pavilion was recently constructed and the playground area is expanding with a new swing set with four toddler swings. New park benches have also been added. WHAT’S NEXT!!! The jogging trail will be reconstructed and irrigation will be installed at all four of the community’s entrance monuments. Landscaping at the monuments will follow soon after the irrigation project is completed. Hats off to this dedicated group of volunteers that is always looking for ways to improve their community and make this older community a wonderful place to call home. C.I.A. Services is proud to have managed this great community for the past twenty-five years. We look forward to many more years to come.